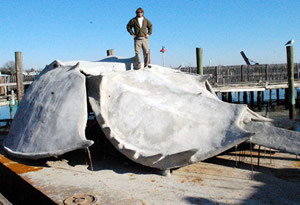 The NJDEP Division of Fish and Wildlife has announced that the deployment of a 47-foot sculpture of a horseshoe crab constructed from concrete, originally scheduled for July, has been rescheduled for Thursday, August 30, 2012, on the Axel Carlson Reef. 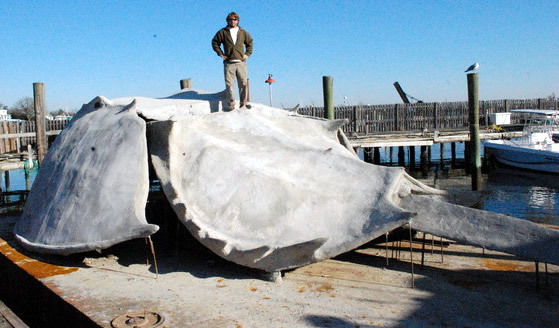 The sculpture is being deployed under the supervision of the DEP as part of the Division's Artificial Reef Program. The sculpture, created by scuba instructor and marine biologist Chris Wojcik, will provide habitat for more than 150 species of marine life, a fishing ground for anglers and a unique area for scuba divers to explore. The immense structure, once deployed, will also be recognized by Guinness World Records as the largest underwater sculpture in the world. Commercial fishers who have gear in this area must move it or risk having it destroyed. The target date for deployment is subject to weather and sea conditions. For further information on this deployment contact Hugh Carberry at 609-748-2022.